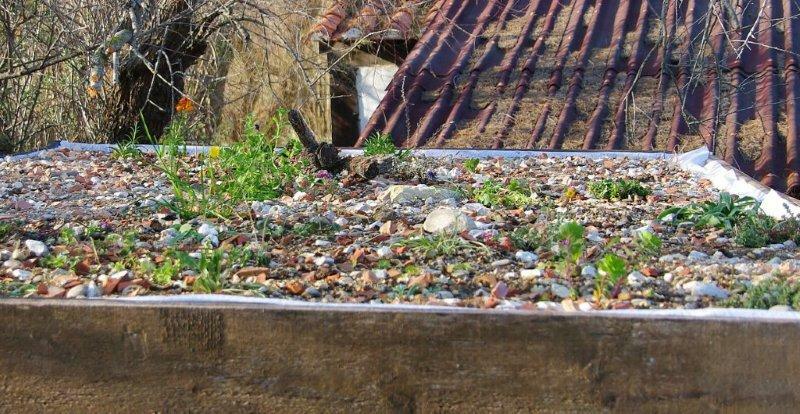 From a a discussion on LinkedIn here is Kevin Songer’s post of a “Natural” Green Roof “, in France, very much like what are called “Earth Roof” elsewhere. I could well imagine replacing the Arundo reed (called Spanish reed here in RSA ) with local Restio or Thatching Reed! 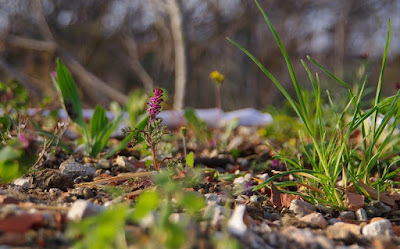 Kevin’s blog Living Green Roof’s is a mine of information on the topic . Very excited to share a series of photographs of a green roof in Southern France constructed primarily using natural materials rather than massive amounts of plastic trays and parts. 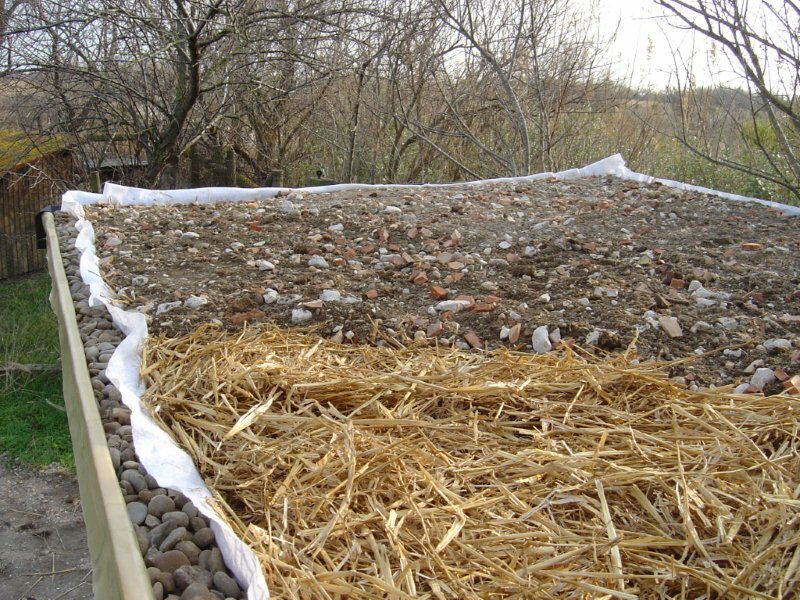 The basic design was fashioned from the LivingRoofs.org design guide – a great resource for anyone interested in constructing a green roof. 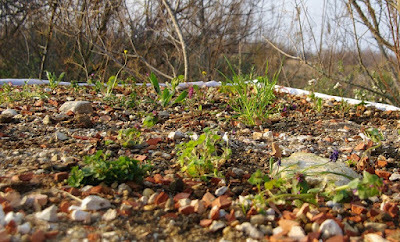 The LivingRoofs.org is, in my opinion, one of the very best resources for green roof design. 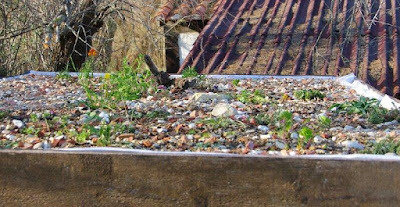 Rather than focusing on commercial advertising the LivingRoofs.org site focuses on making available important design data and examples of green roofs from around the world. The photos here depict in chronological order the basic system approach. Thorough research into native plants was conducted, inventorying local native plant species according to bloom time, life cycle, biodiversity value, maintenance requirements, water issues and drought tolerant qualities and more. 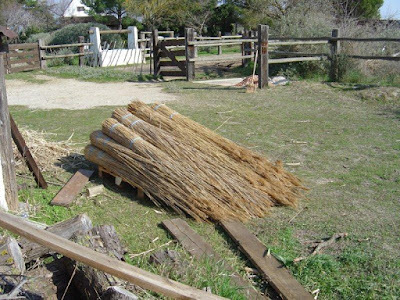 Interestingly, native reed, Arundo species was used for drainage along with broken and crushed tile, stone, sand and compost. The reed used is a endemic plant, one used locally for roofs. 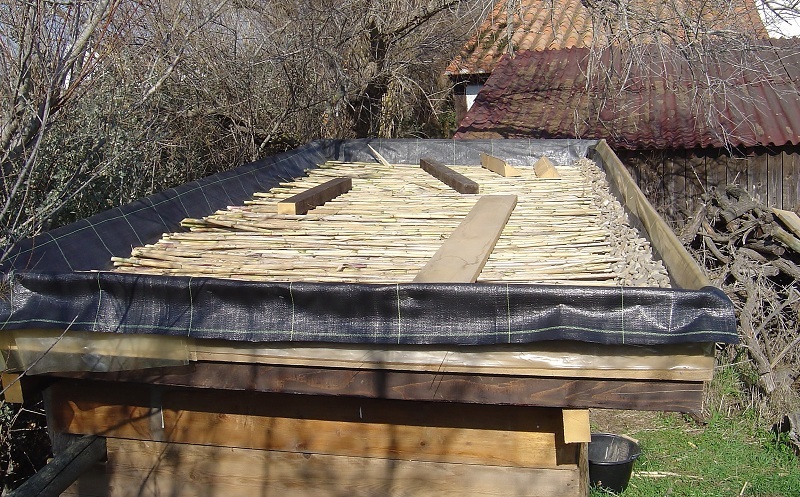 Reed roofs have been historically popular in the Mediterranean area and can last as long if not longer than asphalt shingles. 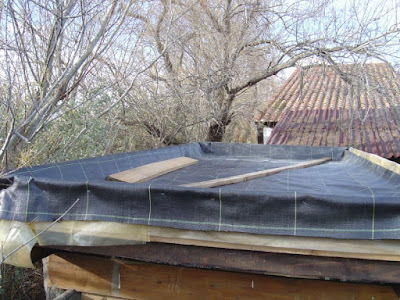 For an interesting review of reeds used for roofing material check out the many websites offering reed roofing products. 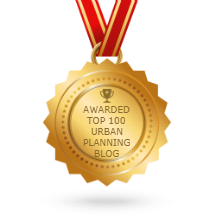 This project is particularly significant in the evolution of world-wide green roof technology as it is a strong statement concerning sustainability and biodiversity. 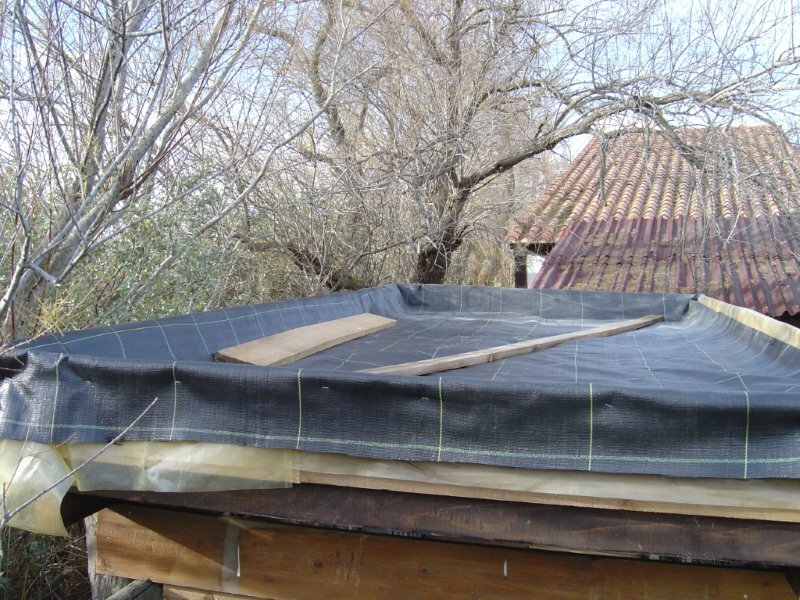 In many aspects our green roof industry has become stale and stagnant. Most if not all systems today are plastics based, have extremely high carbon footprints with use of petro-kiln expanded inorganics for soil media, use monocultures of one or two plant Genus – most of which are exotic plants not even native to the area. All this is great for the bank. But not so good for site ecology. Today, in my opinion many green roof systems are ‘greenwashed’ with true sustainability value. Some say green roofs constructed around monocultures of exotic plants that require regular irrigation and fertilization may be better than asphalt roofs. However, in my opinion, the forced use of exotic landscape plants on a roof filled with plastic trays is no different than GMO practices – forcing an unnatural product into our environments. So this green roof in Southern France may have now set the standard for all future truly sustainable green roofs. Native plants with ethnobotanical and biodiversity value cover the native soil and drainage materials. The woven geo-synthetic fabric is the only material not found locally in nature – and this could possibly be replaced with hemp fabric or cotton burlap. When I look at this roof I see the beauty of native and natural materials. I do not see in black plastics and overused plants. I can tell you the industry will immediately point to long term life cycling comparisons. They will argue expanded shale lasts forever whereas green roofs using natural materials will decompose over time. 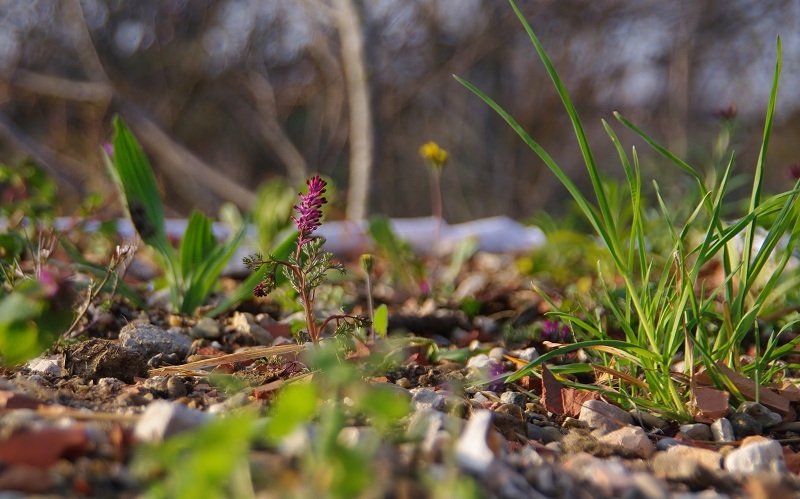 Big corporate green roof industry will argue that the mats of one or two plant Genus are extremely low maintenance and much better suited for the general population than wildflower populations that may evolve and change with the seasons. But this roof, designed with ingenuity and a heart for long-term biodiversity and sustainability is greater in significance, in my mind, than the largest turf or sedum roof built in the last decade. The methods, materials and plant design here now becomes a standard of sustainability for green roofs. Certainly improvements and adjustments will be developed and implemented. Yet the statement of a true ‘green’ roof leaves a lasting impression in my mind. Well, that’s kind of weird but its good thing to have a roof like that because it’s can help maintain green living. Other people setting a garden in their rooftop for commercial use, indeed it’s a practical way of living.